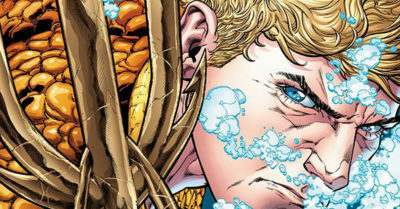 Aquaman is the Rodney Dangerfield of DC Comics – he doesn’t get any respect. Mostly it’s about overlap. Aquaman has super-strength and he’s bulletproof, but so is Superman. He’s the rightful sovereign of a mythical kingdom, but so is Wonder Woman. Where does that leave him? He swims fast and talks to fish. Or, at least, that’s the mocking media narrative that has emerged from Gen X fans who grew up having Aquaman lose every fight they staged with their Super Friends toys. That’s not to say he hasn’t starred in some fantastic stories in the modern comics era. 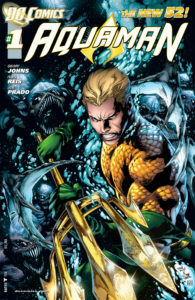 In fact, Aquaman’s under-the-radar status has allow authors like Peter David to completely reimagine his personality for the purpose of telling exiting, innovative stories. Aquaman #1 is self-aware to a fault, giving readers the catharsis of getting all their Entourage-fueled mocking on their hero out on the page where we can all see it. It’s an amusing approach from deconstructionist Johns, but forcing the real world’s obsession with making fun of Aquaman into a comic is a cheap trick. It’s fun while it lasts, but gives no hints as to why we should come back for actual adventuring in the next issue aside from a few pages about incredible hungry piranha people. We’re effectively along for the ride in a day of the life of our hero, who is starting to feel the public’s lack of appreciation for him. He foils a bank heist, though the robbers try to run him over and gun him down in the process – apparently unaware that neither will work. The cops don’t understand why he showed up, since no fish were at risk. Later, he stops by a restaurant only for them to balk at him ordering fish – isn’t that like cannibalism? The utterly pedestrian vibe of the issue has a saving grace in the attractive artwork of Ivan Reis and a bright, colorful set of colors from Ann Reis. 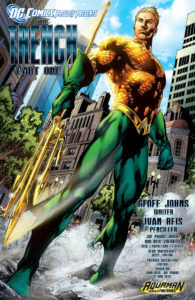 The Reises make Aquaman out to be a golden-haired hunk, and manage to render his gold and green swimsuit as credible superhero armor (thanks in no small part to his rather fierce rendition of the trident). 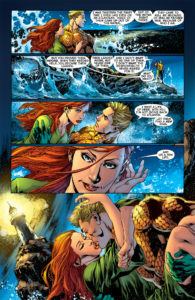 Regular people in a restaurant are a realistic mix of dumpy and cute, but Aquaman’s lover Mera is a knockout – their two pages together will almost make you wish this was a romance comic. 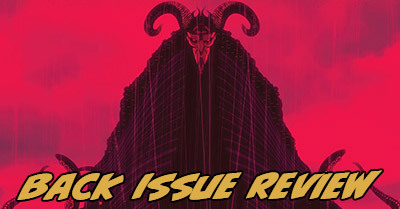 While I enjoyed this debut issue for its information dump and poking fun at our hero, it’s just another boringly “different” plot from DC workhorse Johns. While I’m sure he’ll lead this awkward plot to water and the foes within sometime soon, I wish one of the more ACTUALLY transgressive writers in the relaunch drew this straw. However, I can’t deny that Johns’s script delivers some zingers, which together with Reis’s artwork is strong enough to lift this one past average.